As the Reverend Susan McCann stood outside a public library in Springfield, Missouri, last year, she did her best to persuade passers-by to sign an initiative to ban high-cost payday loans. But it was difficult to keep her composure, she remembers. A man was shouting in her face. He and several others had been paid to try to prevent people from signing. "Every time I tried to speak to somebody," she recalls, "they would scream, ‘Liar! Liar! Liar! Don&apos;t listen to her!&apos;"
Such confrontations, repeated across the state, exposed something that rarely comes into view so vividly: the high-cost lending industry&apos;s ferocious effort to stay legal and stay in business. Last year, activists in Missouri launched a ballot initiative to cap the rate for loans at 36 percent. The story of the ensuing fight illuminates the industry&apos;s tactics, which included lobbying state legislators and contributing lavishly to their campaigns; a vigorous and, opponents charge, underhanded campaign to derail the ballot initiative; and a sophisticated and well-funded outreach effort designed to convince African Americans to support high-cost lending. Opponents of payday lending "believe that people unlike them are just po&apos; chillin&apos; who must be parented by those who know better than they do what&apos;s in their best interest." Missouri is fertile soil for high-cost lenders. 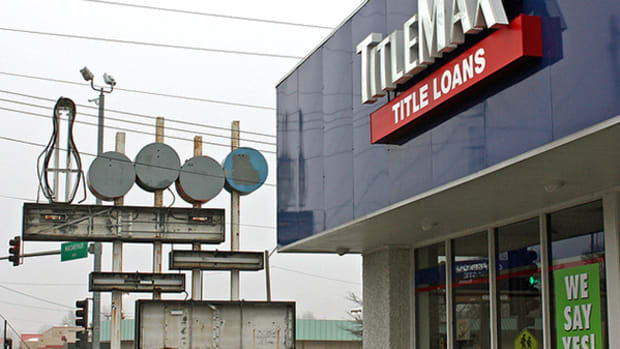 Together, payday, installment, and auto-title lenders have more than 1,400 locations in the state—about one store for every 4,100 Missourians. The average two-week payday loan, which is secured by the borrower&apos;s next paycheck, carries an annual percentage rate of 455 percent in Missouri. That&apos;s more than 100 percentage points higher than the national average, according to a recent survey by the Consumer Financial Protection Bureau. 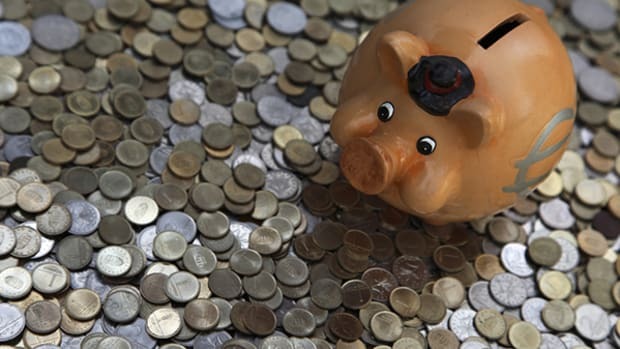 The annual percentage rate, or APR, accounts for both interest and fees. The problem was the legislature. During the 2010 election cycle alone, payday lenders contributed $371,000 to lawmakers and political committees, according to a report by the non-partisan and non-profit Public Campaign, which focuses on campaign reform. The lenders hired high-profile lobbyists, and Still became accustomed to their visits. But they hardly needed to worry about the House Financial Institutions Committee, through which a reform bill would need to pass. One of the lawmakers leading the committee, Don Wells, owned a payday loan store, Kwik Kash. He could not be reached for comment. A coalition of faith groups, community organizations, and labor unions decided to put forward the ballot initiative to cap rates at 36 percent. The main hurdle was collecting the required total of a little more than 95,000 signatures. If the initiative&apos;s supporters could do that, they felt confident the lending initiative would pass. Payday lender QC Holdings declared in a 2012 filing that it had spent "substantial amounts" to defeat the Missouri initiative. QC, which mostly does business as Quik Cash (not to be confused with Kwik Kash), has 101 outlets in Missouri. In 2012, one-third of the company&apos;s profits came from the state, twice as much as from California, its second-most profitable state. If the initiative got to voters, the company was afraid of the outcome: "ballot initiatives are more susceptible to emotion" than lawmakers&apos; deliberations, it said in an annual filing. And if the initiative passed, it would be catastrophic, likely forcing the company to default on its loans and halt dividend payments on its common stock, the company declared. MECO&apos;s first major step was to back three lawsuits against the ballot initiative. If any one of the suits were successful, the initiative would be kept off the ballot regardless of how many citizens had signed petitions in support. Meanwhile, supporters of the ballot initiative focused on amassing volunteers to gather signatures. The push started with umbrella organizations such as Metropolitan Congregations United of St. Louis, which ultimately drafted more than 50 congregations to the effort, said the Reverend David Gerth, the group&apos;s executive director. In the Kansas City area, more than 80 churches and organizations joined up, according to the local non-profit Communities Creating Opportunity. Predominantly African American congregations in Kansas City and St. Louis made up a major part of the coalition, but the issue crossed racial lines and extended into suburbs and small towns. Within one mile of Grace Episcopal Church in Liberty, a mostly white suburb of Kansas City, there are eight high-cost lenders. "We think it&apos;s a significant problem and that it was important for people of faith to respond to this issue," said McCann, who leads the church. In early January 2012, a number of clergy opened their mail to find a "Legal Notice" from a Texas law firm and sent on MECO&apos;s behalf. "It has come to our attention that you, your church, or members of your church may be gathering signatures or otherwise promising to take directions from the proponents&apos; political operatives, who tell churchgoers that their political plan is a ‘Covenant for Faith and Families,&apos;" said the letter. Soon after the Reverend Wallace Hartsfield of Metropolitan Missionary Baptist Church in Kansas City received the letter, a lawyer called. Had he received the letter? Hartsfield remembers being asked. He responded, "If you feel like we&apos;re doing something illegal, you need to try to sue, all right?" he recalls. Ultimately, no suits or other actions appear to have been filed against any faith groups involved in the initiative fight. 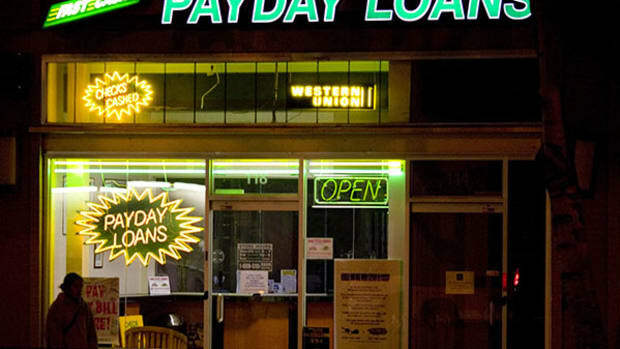 Payday lenders and their allies took other steps as well. A Republican lobbyist submitted what appears to have been a decoy initiative to the Missouri Secretary of State that, to the casual reader, closely resembled the original measure to cap loans at 36 percent. It proposed to cap loans at 14 percent, but stated that the limit would be void if the borrower signed a contract to pay a higher rate—in other words, it wouldn&apos;t change anything. A second initiative submitted by the same lobbyist, Jewell Patek, would have made any measure to cap loan interest rates unlawful. Patek declined to comment. MECO spent at least $800,000 pushing the rival initiatives with its own crew of signature gatherers, according to the group&apos;s state filings. It was an effective tactic, said Gerth, of the St. Louis congregations group. 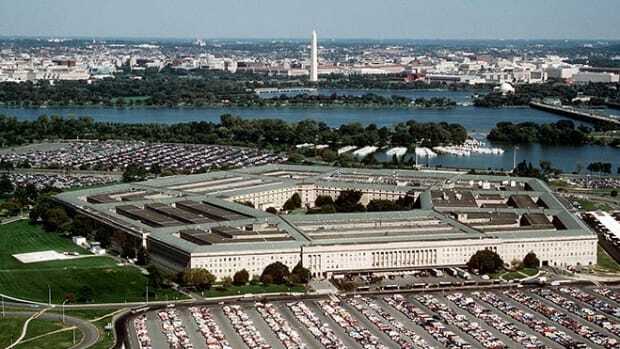 People became confused about which was the "real" petition or assumed they had signed the 36 percent cap petition when they had not, he and others who worked on the effort said. MECO&apos;s efforts sowed confusion in other ways. In April 2012, a local court sided with MECO in one of its lawsuits against the initiative, throwing the ballot proposition into serious jeopardy for several months until the state Supreme Court overturned the lower court&apos;s ruling. During those months, according to video shot by the rate cap&apos;s supporters, MECO&apos;s employees out on the streets warned voters who were considering signing the petition that it had been deemed "illegal." MECO also took to the airways. "Here they come again," intones the narrator during a television ad that ran in Springfield, "Washington, D.C., special interests invading our neighborhoods." Dark figures in suits and sunglasses can be seen descending from a plane. "An army of outsiders approaching us at our stores and in our streets," says the voice. "But together we can stop them: If someone asks you to sign a voter petition, just decline to sign." Installment lenders launched a separate group, Stand Up Missouri, to fight the rate-cap initiative—and to differentiate themselves from payday lenders. 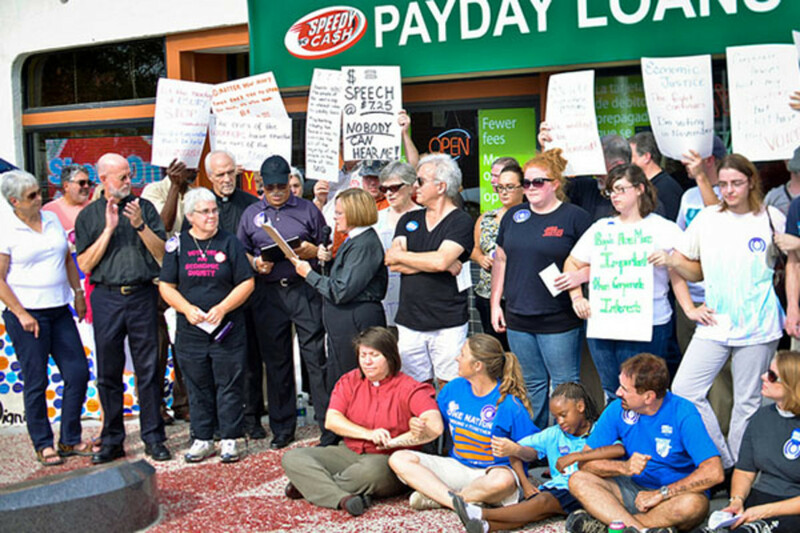 As the group&apos;s website put it, "special interest groups masquerading as grass-roots, faith-based alliances" were not only targeting payday loans but also "safe" forms of credit such as installment loans. 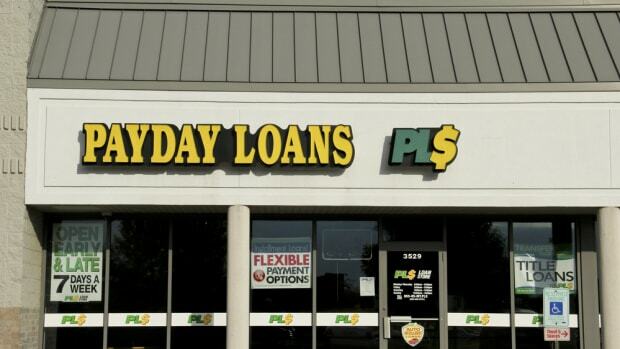 "Stand Up Missouri does not represent payday lending or payday interests," the group said in its press releases. Tom Hudgins, the chairman of Stand Up Missouri as well as the president and chief operating officer of installment lender Western Shamrock, declined to be interviewed but responded to questions with an emailed statement. Stand Up Missouri acknowledges that "some financial sectors" may require reform, he wrote, but the initiative backers didn&apos;t want to work with lenders. Outrage over payday loans, which trap millions of Americans in debt and are the best-known type of high-cost loans, has led to dozens of state laws aimed at stamping out abuses. But the industry has proved extremely resilient. In February 2012, the Reverend Starsky Wilson of St. Louis sat down at a table in the Four Seasons Hotel. The floor-to-ceiling windows reveal vistas of the city&apos;s famous arch and skyline. Lined up in front of him were two lobbyists and Hudgins, he remembers. The lenders had targeted a community that was both important to their profits and crucial to the petition drive: African Americans. Wilson, like the majority of his flock, is black. Wilson was not swayed, but he was only one target among many. At the Four Seasons, Wilson says, he bumped into two other leaders of community organizations who had been summoned to hear Stand Up Missouri&apos;s message. He said he also knew of more than a dozen African-American clergy who met with the lobbyists. Their message, that installment loans were a vital credit resource for middle-class African Americans, was persuasive for some. As a result, Wilson found himself mounting a counter-lobbying effort. A spokesperson for Simmons and Boyd&apos;s firm declined to comment. In Kansas City, Revered Hartsfield also received an invitation from the lobbyists—but that was not the only case, as Hartsfield puts it, of an African American being "sent into the community to try to put a good face on this." While African Americans comprise 13 percent of the U.S. population, they account for 23 percent of payday loan borrowers, according to a Pew Charitable Trusts survey. Green was "Senior Advisor of Minority Affairs" for the Community Financial Services Association, the payday lenders&apos; national trade group, then director of "community outreach" for Advance America, one of the largest payday lenders. Finally, in 2012, he opened his own consultancy, The Partnership Alliance Co., which, according to his LinkedIn profile, focused on "community relations." Over the past decade, he has popped up during legislative fights all over the country—North Carolina; Georgia; Washington, D.C.; Arkansas; Colorado. It is unclear who hired Green in 2012—he declined to comment, and MECO did not report paying him or his company. But to Hartsfield, it was clear he was there to advocate on behalf of payday lending. Green once penned an open letter to Georgia&apos;s legislative black caucus arguing that government regulation on payday loans was unneeded and paternalistic: Opponents of payday lending "believe that people unlike them are just po&apos; chillin&apos; who must be parented by those who know better than they do what&apos;s in their best interest," he wrote, according to the Chattanooga Times Free Press. During their private meeting, Hartsfield said, Green made a similar argument but also discussed church issues unrelated to the ballot initiative. The payday lending industry might be able to help with those, Hartsfield recalled Green saying. The message the minister received from the offer, he said, was "we&apos;ll help you with this over there if you stop this over here." Green referred all questions to his new employer, the installment lender World Finance. In a statement, World did not address specific questions but said the company was "pleased to have Mr. Green as a member of its team to enhance World&apos;s outreach to the communities that it serves and to provide him the opportunity to continue his many years of being personally involved in and giving back to those communities." Hartsfield did not take Green up on his offer, but the former athlete has served as a gateway to the industry&apos;s generosity before. In 2009 in Colorado, where payday loan reform was a hot topic (a bill ultimately passed in 2010), Green presented the Urban League of Metro Denver with a $10,000 check on behalf of Advance America. Landri Taylor, president and chief executive of the organization, recalled that Green had approached him with the offer and that he was glad for the support. He also said that lending was not a core issue for his organization and that, even if it were, the contribution couldn&apos;t have bought its allegiance. In some areas, such as Springfield, the work resembled hand-to-hand combat. Through intermediaries, such as ProActive Signature Solutions, the initiative&apos;s opponents hired people to oppose it. Marla Marantz, a Springfield resident and retired schoolteacher, was hired to gather signatures for the 36 percent cap initiative. Just about every day, she could expect to be joined by at least one, and often several, of ProActive&apos;s employees, she says. Wherever she went—the public library, the DMV—they would soon follow. It was a tactic both she and her adversaries (with whom she became very familiar, if not friendly) called "blocking." "What we&apos;re doing is preventing them from being able to get signatures," one ProActive employee says on a video shot by a Missouri State University journalism student. Asked to describe how "blocking" works, the employee says, "Usually, we get a larger group than they have. We pretty much use the power of numbers." In the video, as Marantz stands outside a public building, she is surrounded by three ProActive employees. ProActive&apos;s employees did not identify themselves to voters as affiliated with payday lending, Marantz says. They sometimes wore T-shirts reading "Volunteer Petition Official" or held signs urging citizens to "Stand up for Equal Opportunity." In May 2012, Missourians for Responsible Lending, the organization formed by supporters of the initiative, filed suit in county court in Springfield, alleging that MECO, through ProActive, was illegally harassing and assaulting its signature gatherers. The suit included sworn declarations by Marantz and three others who had said they had endured similar treatment. It called for a temporary restraining order that would keep MECO&apos;s employees at least 15 feet away. MECO, via its lawyers, fired back. The suit was an unconstitutional attempt by supporters of the initiative to silence their political opponents based on alleged "sporadic petty offenses," MECO argued. Even if the initiative&apos;s detractors "engaged in profanity-laced insults all of the time," they said, such behavior would still be protected by the First Amendment. Houser called the suit "frivolous" and said he was happy to let MECO&apos;s lawyers handle it. The suit stalled. "Blocking" wasn&apos;t the only problem initiative supporters encountered. Matthew Patterson ran a non-profit, ProVote, that coordinated signature gathering in the Springfield area. On the night of April 25, 2012, Patterson put a box of petitions in his car. Then, realizing he had forgotten his phone in his office, he locked his car and went back inside. No arrest was ever made. Volunteers from Kansas City and St. Louis converged on the area to recoup the lost signatures. The final deadline to submit signatures to the secretary of state&apos;s office was less than two weeks away. But the state&apos;s rules required that they collect signatures from at least five percent of voters in six of the state&apos;s nine congressional districts. They had met that threshold in five districts—but in the First District, which includes North St. Louis, they were 270 signatures short. Eventually, with only a couple of weeks before the deadline to finalize the November ballot, backers of the initiative decided they could not match the lenders&apos; ability to check thousands of signatures. They withdrew their challenge. 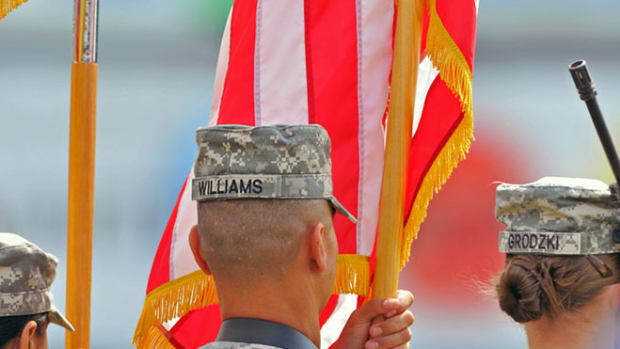 The initiative&apos;s supporters now have their eye on 2014, and they have made the necessary preparation by filing the same petition again with the secretary of state. Last May, Jewell Patek, the same Republican lobbyist who filed the industry&apos;s initiatives in 2011, filed a new petition. It caps annual rates at 400 percent. The installment lenders have continued their effort to woo African Americans. In December, Stand Up Missouri was a sponsor of a Christmas celebration for Baptist ministers in St. Louis, and in June, it paid for a $20,000 sponsorship of the National Baptist Convention, hosted this year in St. Louis. It&apos;s retained the same high-powered African-American lobbyists and added one more: Cheryl Dozier, a lobbyist who serves as executive director of the Missouri Legislative Black Caucus. Lastly, Willie Green, according to initiative supporters who have spoken with the ministers, has made overtures to African-American clergy on behalf of World Finance.